The makers of James Bond's latest outing, Skyfall, cut a couple corners in production and used modern 3D printing techniques to fake the decimation of a classic 1960s Aston Martin DB5. The movie studio contacted Augsberg-based 3D print firm Voxeljet to make 1:3 scale replicas of the car for use in explosive scenes during the new film. 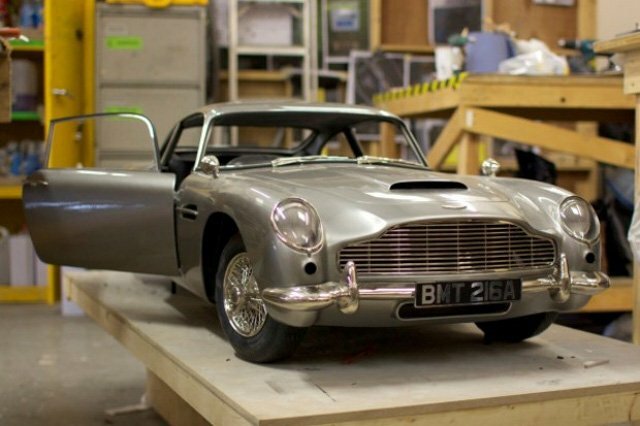 The company churned them out through a VX4000 3D printer and shipped the 18-piece DB5 miniatures to London's Propshop where they were assembled, painted and touched up with fake bullet holes, 3ders reports. The final products were then used to shoot an adrenaline-pumping scene which concludes with the total destruction of the DB5. Badum tish and there goes the spoiler... along with the rest of the car. Bear that in mind when you spend your weekly wage on popcorn to accompany the extortionate cinema ticket. As impressive as 3D printing has become, Skyfall had a budget of $200m and we don't even get to see a real car explode. Cheapskates. Gillian Anderson: The next James Jane Bond?